Back to Congress Street we go for...Congress Street IPA. Yeah, I didn't think that introduction through very well, now did I? I have yet to be disappointed by a Trillium IPA, so I'm anxious to see how this one holds up. Pours a light orange, very hazy-looking. Produced two fingers-worth of a bubbly, white head. Big, zesty, acidic lemon on the aroma. A lot of bitter, herbal and floral hops with a small, west coast onion/garlic presence. If you take some freshly-picked flowers in the springtime and squeeze a lemon slice over them, then that's pretty much what you get here. There is just a ton of lemon and hops coming out of this beer. The bitterness is at near-perfect levels up front and the finish is zesty, floral notes. I don't know what hops they use, but you can taste each of them from earthy to fruity to dank. With a profile so hoppy and floral, it does have a dry mouthfeel, but it doesn't dehydrate your tongue and the finish, while bitter and hoppy, does go down nicely and before you know it, your palate is ready for another swig. 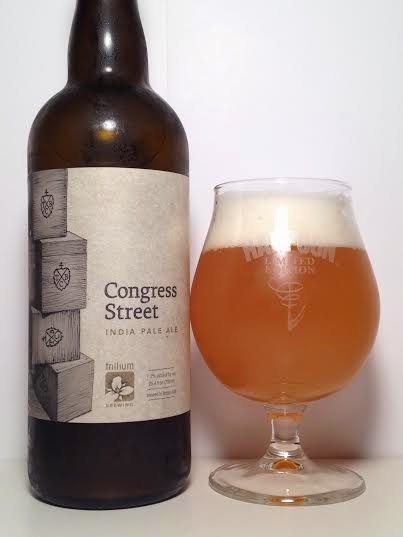 Congress Street IPA strikes a superb balance between floral hops and acidic lemon flavor. As it warms up, the bitterness can bite back just a little, but not enough to make you think twice. Pretty dry on the finish, but everything else is top notch.